It was a dark and stormy Monday morning, and I was not at all inclined to get out of bed. But I knew what was waiting for me at Ride78 was far more inspiring than my soft pillow. Harder than rolling over to my other side. More interesting than my recurring dreams of James Franco. Well, more productive. 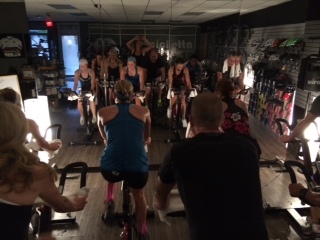 Christine Fletcher knows how to inspire a spin class, and can transport the most dedicated armchair athletes into Ironmen. So I made my way to La Bicicletta, her new home for sweating out toxins, and breathing in life. I’m not going to lie: you’re not listening to the most dedicated spinner. I won’t be the last girl who fakes it when I’m told to add a few gears (hint: you can touch the lever but not move it, so to speak). But Chrissy’s calm demeanour packs just the right amount of Kool-Aid for me to pedal harder. She eases into warm up and I’m convinced momentarily that hey, I’m in pretty good shape. I got this. Then the sweat that initially dotted the floor under my bike like a light drizzle turns into a dangerous and slippery river, and I’m not so sure anymore. At this point Chrissy notes most people are still in bed, which fills me with such smug self-righteousness that when she next tells me to add three gears, I actually do. Spin class is a lot like life, easy to begin with, but then you’re pedalling for your life and crying for a merciful fifteen second rest. And in those fifteen seconds, there is an appreciation for the work. It’s a continual ebb and flow, where desire and dedication reap rewards. In the end, the ultimate achievement is in the doing. Yeah, I did that. Probably before your alarm went off. The hills were high, the flats were fast, and as for the time, it flew.